When you own a progressive company, it is critically important to manage the Human Resources. You can’t achieve the objective by using age-old methods. Switch to Oasis-Human Capital Management System by Alterego, which is flexible, powerful, and sophisticated. As your business grows, you need more people in the team. The system is capable of handling the business needs with a wide range of functionalities. You don’t have to add additional resources for maintenance and deployment of another system. A good Human Capital Management System has to be robust enough to meet your organizational needs. At the same time, it has to be adaptive and flexible. Oasis is a great sigh of relief for those who want modern, state-of-the-art software at reasonable prices. It takes the challenging business needs without any hassles and enables organization leaders with tools and procedures required for optimizing human resources. Keep the HR team relieved from unnecessary burden and workload of managing mundane activities. The seamless Oasis keeps them free for activities that add value to the core business. It is a comprehensive solution for total human capital management. 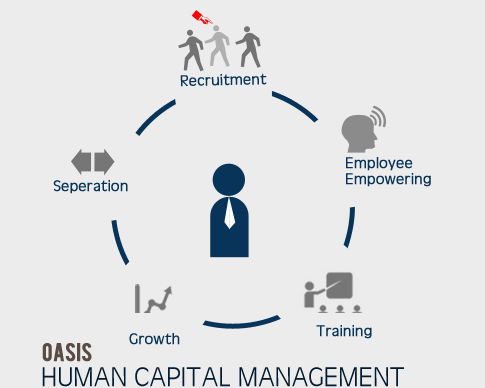 Oasis offers an effective integration of Human Resources module to other peripheral systems. Thus, you have a seamless transition across the organizational modules. Automation reduces manual activities, and you have increased accuracy and timeliness in the system. Since everything is done using the system, there is no possibility of a security breach or data leakage. Achieve compliance with statutory and other audits by making HR operations system-driven. As employees become more and more techno-savvy, self-help modules (or Employee Self Service) are quite common. They enable employees to manage most of the things their own, without having a dependency on the HR people. Decentralization of powers relieves HR team members from the unnecessary workload. Self-service module enhances information accuracy, reduces costs and eliminates delays. Employees feel more empowered and round-the-clock availability of the system is greatly convenient for everyone. Self Service module of Oasis offers two sub-categories; Employee Self Help and Manager Self Help. Employee module offers a wide range of functionalities such as Compensation Management, Personal Data Update Wizard, Access to Online Resources, Employee Intranet, Message Boards, Access to policy documents, etc. Manager module offers a list of useful utilities to the managers. Leave management, employee management, compensation management, event logs, performance evaluation and compliance modules make their work easy. As an entrepreneur, you don’t want any injustice to the employees by not paying for their work contribution. At the same time, you don’t want to be cheated by employees by claiming absence-related benefits. Leave Management module of Oasis is a fine tool for HR and Finance team members to ensure that not only the leave programs are being managed efficiently, but the employee attendance (and absenteeism) is also being tracked accurately. You can define the framework of leave policy and make a workflow around it. Since Leave approval and processing happens automatically, there is no chance of errors. Consolidation of information in the form of reports can be used for analysis and planning. The module is equally helpful for employees, managers, and HR professionals. Statistics says that Payroll processing consumes the majority of the productive time. HR team can’t concentrate on other important activities because they spend most of the time in processing leave, wages, and salaries. Oasis makes the life simple by offering end-to-end, automated payroll processing. Right from time and attendance recording to pay slip generation and from salary processing to MIS; everything happens in a smooth and smart manner. It is said that the best workforce remains best forever if it keeps the knowledge updated. Training and development are critical factors in an organization. Oasis gives a user-friendly training module that identifies the training needs, segregates them and presents in an actionable format. It gives an at-a-glance view of training needs in the company. Recruitment module of Oasis speeds up your hiring process by connecting you to comprehensive talent database. With amazing capabilities of searching best-fit candidates instantly, you can connect to the right people almost instantly. In the fiercely competitive market today, only early bird catches the worm. Reduce the time to find out a suitable candidate, optimize the hiring cost per employee, and achieve amazing efficiency in the recruitment process by implementing Oasis. As you don’t need to pay any cost of publishing the requirement or tracking applications, additional cost incurred in procuring Oasis gets compensated. Annual performance appraisal is the integral and essential aspect of HR responsibilities. When you do it with a sophisticated, well-developed system, employees develop a great trust and respect in the system. Oasis helps you in achieving the confidence of employees by providing a comprehensive performance measurement and appraisal module which is easy, swift and reliable. Performance measurement is not a one-time, discrete activity, but it is a continuous process. Hence, it should be handled systematically.